Looking to book a hot air balloon ride? Pick a hot air balloon company that’s going to be safe and fun. Find out how here. Every year you tell yourself that you’ll finally conquer your fear of heights, and you’d like nothing more than to stick to your resolution this time around. In order to show yourself and everyone around you that you mean business, you’ve actually started vetting your first hot air balloon company. In order to show yourself and everyone around you that you mean business, you’ve actually started vetting your first hot air balloon company. Of course, you’re in over your head; you don’t even know the first thing about selecting the right hot air balloon company. The only thing you know is that you want to go for a ride in the sky. How, then, should you go about choosing a company that will do right by you? What exactly should your vetting process look like? 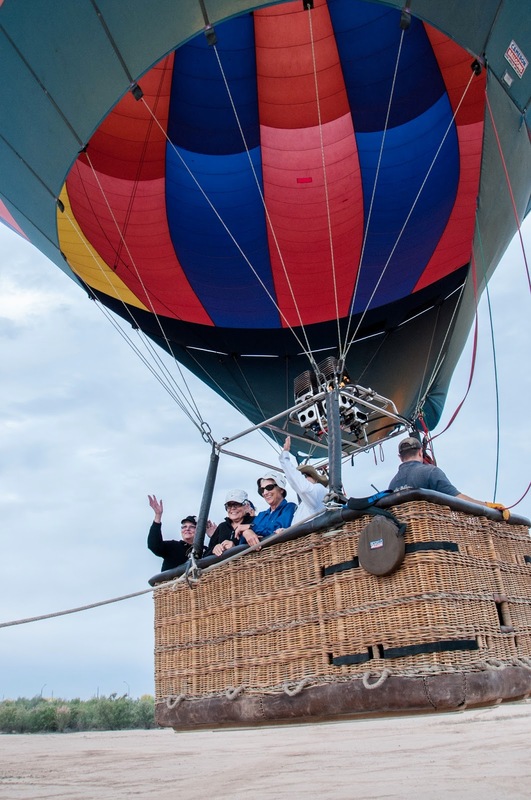 If you stick around for a while, we guarantee that we’ll give you some of the most important information you need to make your hot air balloon ride a success. Anyone who has a sense of self-preservation knows not to get into a hot air balloon (or anything that moves) with an unlicensed pilot, and when we say “unlicensed” here, we mean to say that the pilot does not meet the Federal Aviation Administration‘s requirements. Needless to say, we assume that you belong to the party of people which we’re referring to. Still, actually selecting a licensed pilot is probably going to be the least of your worries since how you go about selecting your pilot is the more important issue. To be blunt, if your selection process involves a third party’s services (i.e. a broker of some sort), you’re setting yourself up for disappointment. Ride brokers, while they might seem helpful, often scam customers and don’t necessarily have your best interests at heart; even if they manage to get you in contact with a licensed pilot, there is no guarantee that this pilot actually owns or even flies the balloon you’ll be riding in. Fortunately, separating a broker from an actual pilot isn’t too challenging. The internet is just one of many sources that you can use to verify whether or not you’re dealing with a broker or pilot. Finding a licensed pilot isn’t equivalent to finding a credible hot air balloon company because you could easily find a subpar company which happens to have a few good pilots. That said, once you find your pilot, you’ll need to start gauging the company’s credibility. That said, once you find your pilot, you’ll need to start gauging the company’s credibility. Generally speaking, you’ll be able to find official evidence of a company’s credibility online, and please note that “official evidence” doesn’t include customer reviews. Yes, customer reviews are definitely useful (and we’ll actually discuss them a little later), but they probably aren’t going to give you much information beyond some critiques of the business’s services. For instance, customers usually aren’t privy to any run-ins with the government which involve the company’s conduct, probably because companies typically don’t broadcast their legal troubles. Such legal troubles could include, for example, a history of accidents. Customers also aren’t going to know much of anything about a company’s licenses to provide their services. Luckily for you, there are databases, such as the Better Business Bureau, which are committed to providing customers with all of this information and more. Having said as much, make sure that you take advantage of these types of resources before deciding on a hot air balloon company. In all fairness, a business’s credibility and its reputation are undeniably linked to each other. Even so, the two should not be conflated. Unlike a business’s credibility, a business’s reputation takes customer experience and feedback into consideration. Even so, the two should not be conflated. Unlike a business’s credibility, a business’s reputation takes customer experience and feedback into consideration. Hopefully, you can see why the two should remain separate: A customer’s experiences don’t necessarily delegitimize a company’s services, nor should they in most cases. Still, customer ratings should be taken into account if you want to enjoy your hot air balloon ride, primarily because customers will give you honest accounts of what their experiences were like. They’ll tell you, for instance, how friendly (or unfriendly) the staff is and just how attentive staff members are. Not only will you be able to get details of this nature, but you’ll also be able to get a feel for just how “safe” the company’s services are. No, we’re not suggesting that hot air balloon rides are inherently unsafe, but we are suggesting that sometimes companies get lax when they feel that they can afford to. Needless to say, though, you should take customer reviews with a grain of salt. Or two. Everyone has different standards, something that is routinely reflected in reviews. There is also another reason that you shouldn’t put too much weight on customer reviews: You’ll overlook many small yet legitimate businesses that might be good options for you. Seeing is apparently believing, which is why there is absolutely nothing wrong with requesting that a pilot allows you to observe his or her hot air balloon rides from a distance. During an observation, you should be looking for any and all red flags. That is to say, if the pilot you’re vetting does or says something that makes you feel uncomfortable, you shouldn’t hesitate to turn him or her down. You should also be sure to ask any questions that come about during the observation. If your company of choice tries to do something to discourage an observation (such as charging you a fee for it), we recommend that you find a company that will be more open to assuaging your fears. While seeing might be believing, however, you shouldn’t necessarily take an observation as the gospel truth. In other words, you’ll have to assume that the company is putting on a bit of a show for you, as it does for most visitors since it’s ultimately a business. The information we’ve provided here is by no means a complete guide. Every individual is different and will undoubtedly be looking for a different experience. The above information is, nevertheless, essential for those of you who are looking to have a good time and do safely. Having said as much, we strongly encourage you to personalize your search for the hot air balloon company that is right for you. We’re just glad that we could give you a good foundation.